The compi is not a rocket on the street, but there are many ways to rise to power of the car. One of them, is changing and tweaking the throttle body. 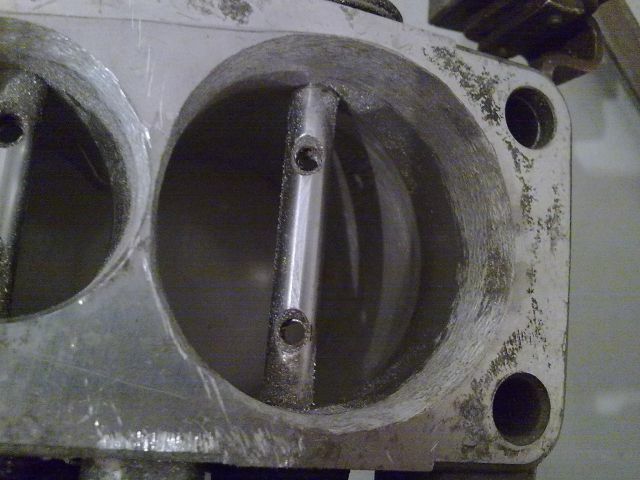 As you can see, the smaller flap is obstructed, and this is blocking the air going trought the throttle. The difference is already huge. You can just replace the throttle body and go drive around. You will notice a big difference already. Would be wonderful to see all the pictures that are unavailable atm, do you still have them somewhere? This is a really interesting mod.. How much power do you think you gain by that? 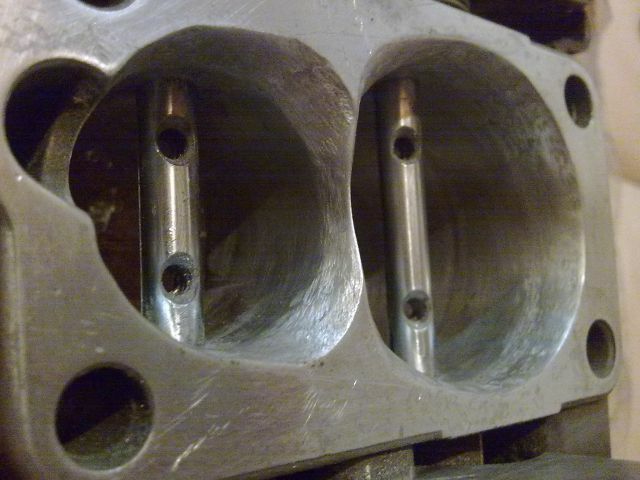 Skull do you think that this could be done to an ADA engine? Also is there anything else you believe that could be done to improve the ADA (e.g. the gearbox that is really crap) ? thanks mate and keep up the good work..
some friends had similar problems with the crappy 1.6 101hp engine, and they used the abk gearbox, and said that is was much better for driving. Thanks for the quick answer.. You mean the ABY engine? Surely you can't tell me how many hp, bad question, but I mean that the difference is noticeable, isn't it? 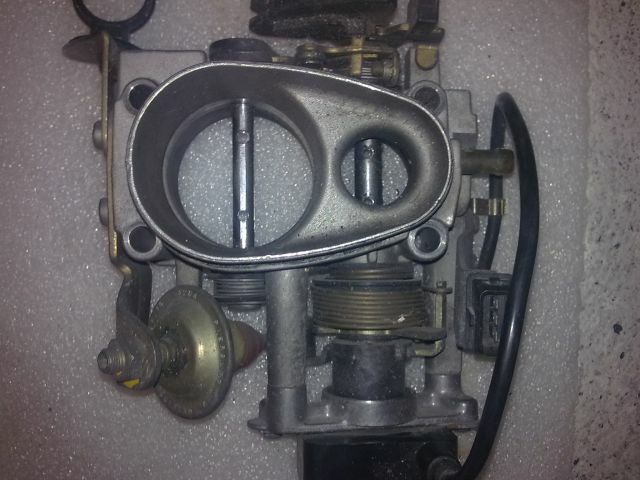 the throttle body must be from a 2.0 20v or 2.3 20v engine, the aby throttle body is totally different. the difference in power is very noticeable, it is like having one passenger less in the car, and i still have to remove the catalitic converter, which has the smaller pipe diameter 50, everyi thing else is diameter 60. so it will give at least some 5hp. And why is that? I mean what is the difference between the ACE and ADA throttle bodys types and the 10v and 20v engines? Just curiosity.. 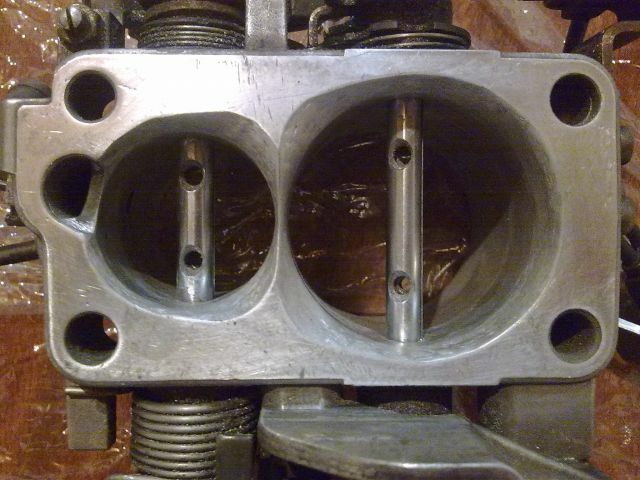 The ADA is 8v as you already know..
You can clearly see the difference, the small throttle is very restricted in the 16v throttle body, which gives less total air flow. 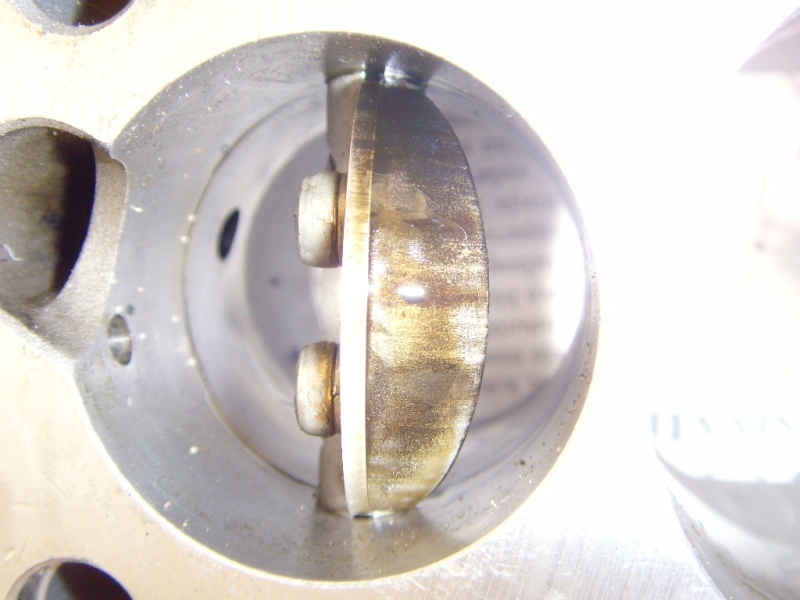 how does the ADA throttle body look like? I understand that.. My question was why you suggested me to use the throttle body from an 20v engine, while you had used a 10v one.. for that different I'm talking about.. I haven't removed my throttle body yet so I don't have a pic yet.. So would something like this do the job? 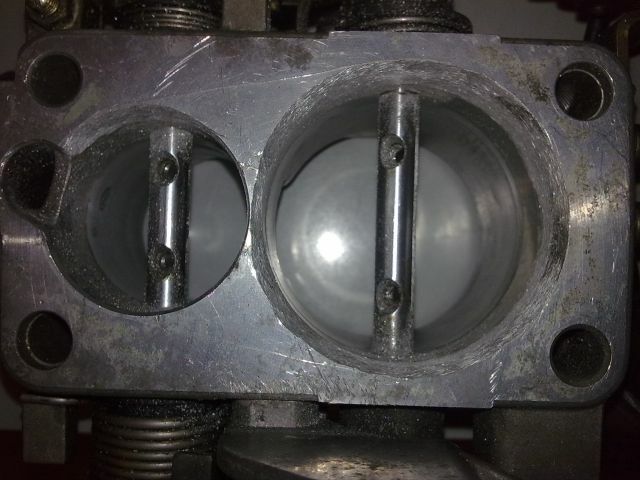 no, this is not the right throttle body. 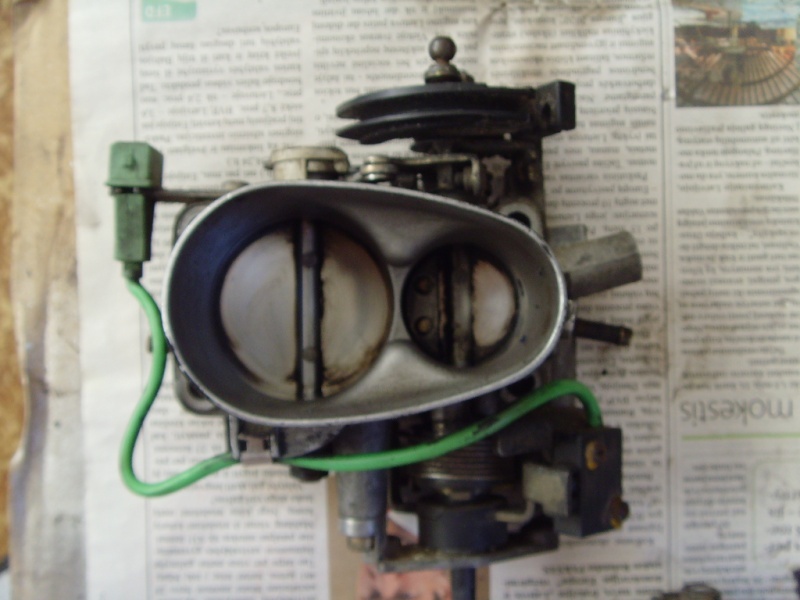 At last I found a throttle body from a NG motor at the local scrap for 70e, so tomorrow I was of putting it on. So Skull, before I take the big step I have one last question (sorry for asking over and over but, I'm a student so the 70 means to me ) have you faced any problems running on idle or any general instability on rpm? I'm just asking because I can't understand how engine manages the extra air if the ECU does't know and is ratio of mixture right? That's why you have a oxygen sensor(lambda). It measures the Air/fuel ratio and gives signal to the ECU ECU regulates then the amont of fuel. I've seen this been done on some other cars, and it worked just fine. I think you will notice the engine revs faster with this mod. 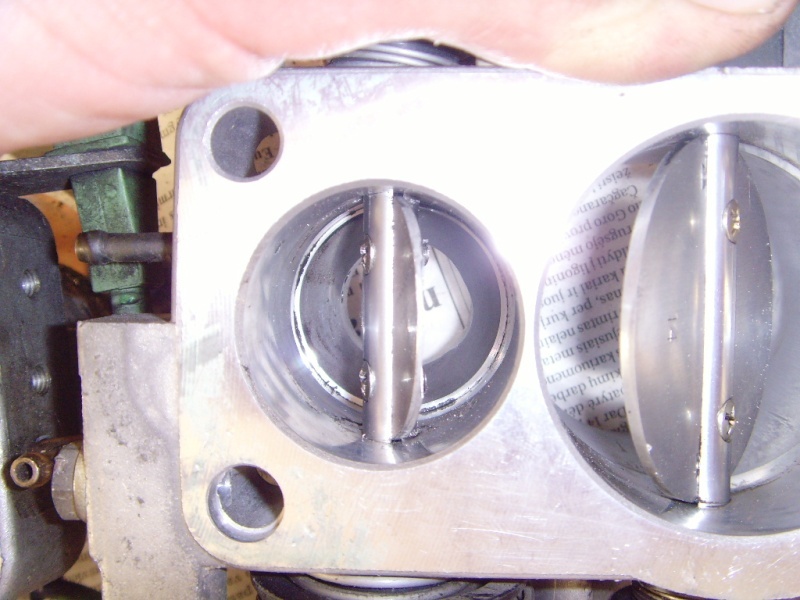 no problems with the ng throttle body. $küll wrote: no problems with the ng throttle body. TPS (throttle position sensor)? Now thats weird. On newer engines the ECU will go into emergency mode if the TPS doesn't work properly. I don't know with the ACE-ECU. Have you checked your AFR? $küll wrote: what is AFR? Sorry, I'm used to short terms..
Maby you can read the values with VAG-COM. aha, no i didnt check, but the car is going really well. both HP an NM raised very much from stock with all the mods i have made. maybe is should add some fuel to the mixture, i had the MOT (technical check @ registration) last week, and the co2 readings were a little high, but it passed even with the sport cat. without the walls of the throttle, and the pedal was more sensitive . I tried this throttle body mod today. I replaced the ACE's tb to the NG's tb. Idle speed raised to 2000 rpm and when i took test drive idling was around 3000 rpm. When i unplugged the ISV connector idling was about 1500 rpm. I think the problem is the lacking of potentiometer? I also have 7a's tb, I didin't try it because the potentiometers connector is two pin connector and ACE's is three. 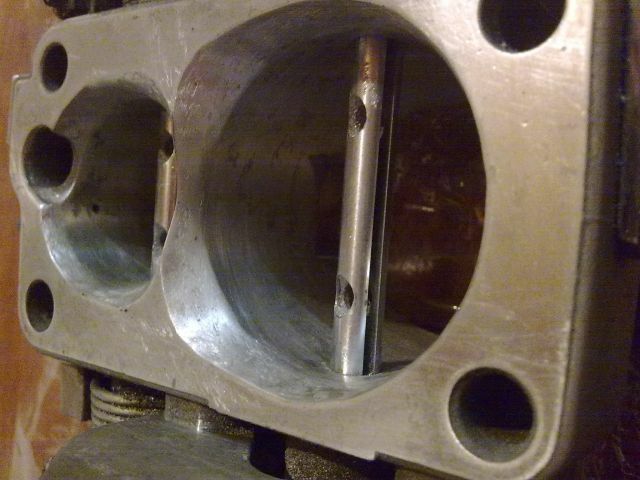 it is certainly not an issue of the potentiometer, because i tried 2 different 5cyl throttle bodies, and the engine runs perfectly with both of them. the only problem i can think of is some air leak, maybe you didnt connect the pipe that goes to the throttle body, or maybe the most plausible one, that you have a screw in your throttle body, that the NG engine uses to set the idle.